J.T. Sims and D.C. Wolf, Poultry Waste Management: Agricultural and Environmental Issues. P.K. Sharma and S.K. De Datta, Rainwater Utilization Efficiency in Rainfed Lowland Rice. J.L. Richardson, J.L. Arndt, and J. Freeland, Wetland Soils of the Prairie Potholes. V.P. Evangelou, J. Wang, and R.E. Phillips, New Developments and Perspectives on Soil Potassium Quantity-Intensity (Q/I) Relationships. S.P. Loss and K.H.M Siddique, Morphological and Physiological Traits Associated with Wheat Yield Increases in Mediterranean Environments. Volume 52 features a number of advances in the crop and soil sciences. 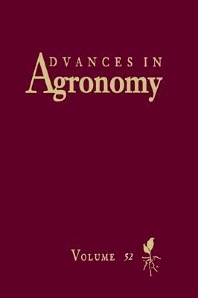 These include a comprehensive review of agricultural and environmental issues associated with poultry manure management; aspects of rainwater utilization efficiency in rainfed lowland rice; a discussion of wetland functions as reflected in hydric soils and hydric soil development of the prairie potholes of central North America; advances in soil quantity-intensity (Q/I) relationships; an index used to assess nutrient availability in soils; and morphological and physiological traits associated with wheat yield increases in Mediterranean environments. Researchers and students in agronomy, crop and soil science, genetics, botany, and waste management.